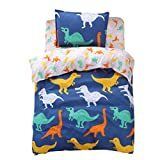 Package contain: 1*Pillow Case,1*Quilt Cover,1*Flat Sheet Size: Pillow Case: 20*30 inch Quilt Cover: 68*86 inch Fitted Sheet: 66*96 inch Kids will love these sheet sets! The sheets feature an all-over print and will fit a standard twin bed properly. Set includes: One flat sheet, one Duvet Cover and one standard matching pillowcase. Our fabric is softer than most cotton and features a breathable weave for an easy machine wash every time.